Marble is considered a soft stone and requires love and care to stay looking fresh. There are many alternatives to marble that are close to maintenance-free, leaving you to worry about more important things! As the consumer becomes more educated, many are aware of the stresses of having marble in the home can bring. When caution is exercised, sealers are applied and care is taken, marble can last many lifetimes. In today’s busy world, that isn’t always achievable. There is nothing quite like the classic look of Carrara marble, but due to its natural form, the marble will etch, stain and scratch. The good news is that there are always alternatives! Here are some natural and manmade alternatives to marble similar in appearance but superior in performance. Quartzite demand increased by 20% in 2017. It is predicted to continue into 2018. Engineered stones like porcelain and quartz continue to grow in popularity. Global stone trends are seeing a shift toward the more high-performance natural stone. The American market has gone up 20% in Brazilian quartzite sales only in the last year. Quartzites have a lifelong guarantee and are generally a foolproof option. 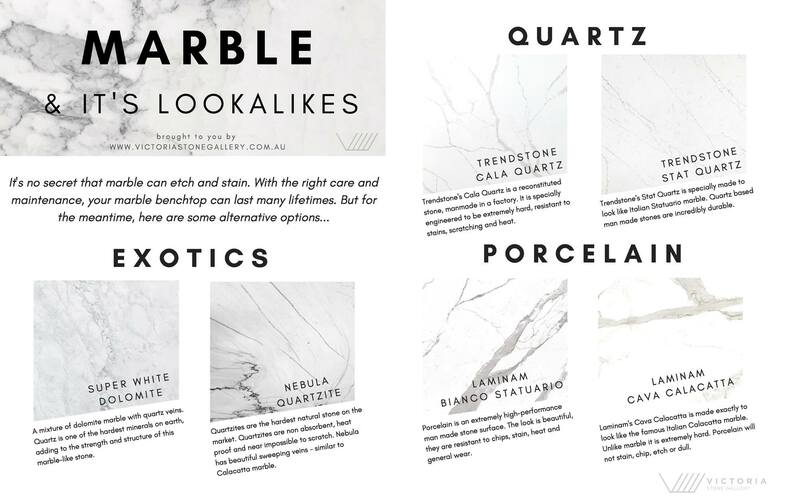 Quartzites are cheaper than the premium quality marbles like Calacatta or Statuario. Some other popular colours of quartzite are White Macaubas and Mont Blanc. Super White (or White Fantasy) continues to grow in popularity too. Less hard than a quartzite, but harder than a typical marble. Here at Victoria Stone Gallery, we specialise in exotic stone slabs from Brazil. Keep your eyes peeled for these speciality stones, and much more to come in the New Year. Check out the range at Victoria Stone Gallery.